Woot! I’ve got another goodie for everybody. Today’s freebie is a set of 5 delicate vintage text effect photo shop layer styles and and a PSD work file. Font used: Lobster Two Italic. If you’re curious about the font on the side, it’s PT Banana Split. If you’ve never installed styles in PS, have no fear! These come with installation instructions. Thank you for your sweet comments on my blog. I really appreciate them and love to hear from you, too! Hope all is well your way! Thank you for these cuties!! 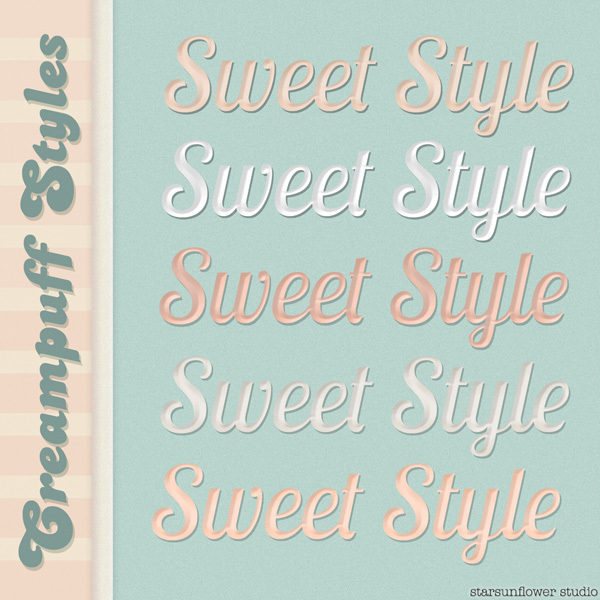 I tried to download Sweet Styles Cream Puff Styles but after the download I received a red warning that read … this zip is not commonly downloaded and could be dangerous …..Discard. I know that you are a VERY SAFE site. Next time should I just download anyway. God bless you. Hello Sister Mary Judith. I’m working on changing all of the download links. Apparently the third party encryption service I was using (called otixo) is causing the error. I will reply when that resource has been updated to the new download link. I should have these finished up by tonight. Thanks for letting me know! This link has now been updated to point to my dropbox. I am not sure why the Otixo service was causing that problem. The files are safe. At least I was able to resolve the issue! Thanks for letting me know. Can these styles be used in Photoshop Elements as well?